The legend of Big Star – and the solo careers of Chris Bell and Alex Chilton – came to me sometime in the mid 90’s while I was deep in my pseudo intellectual elitist underground band phase. The idea that this deeply emotional – spiritual, even – music failed to make an impact when released intrigued me. Big Star’s #1 Record is the only Big Star album to feature Chris Bell, one of the band’s founders who would go onto lead an interesting life in the 70’s and unfortunately became a member of the “27 Club” after a car wreck in 1978. His solo recordings were released posthumously on the 1992 compilation I Am the Cosmos. Alex Chilton gained notoriety for his prickly personality, his association with the punk scene, his drug fueled sessions for Big Star’s Third / Sister Lovers, and basically being dismissive of Big Star for most of his life. I like Alex Chilton – respect him, like most of his music, and am appreciative of his contributions to the Big Star legacy. I LOVE Chris Bell with all my heart. The 1st time I heard his solo music, it was an eye-opening experience. Pain, spirituality, longing, and romance all seemed to coexist within these songs. They spoke to me on a visceral level in a way that I’ve experienced with only a few other artists. 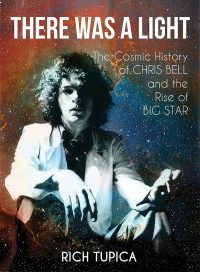 This book takes various interviews conducted over the last 45+ years and tells the narrative of the Big Star story with a focus on Chris Bell. It features countless photos that haven’t been seen before and a unique perspective that makes the reader feel a part of the story. Chris Bell is still gaining fans in the modern era which is an incredible feat for someone who sold so few records in his lifetime. The book outlines what was happening with Big Star after Chris left the band and explores what Chris was doing in those years. Not just a music based biography – this is an interesting overview of his entire life. There have been a few other Big Star books that I enjoyed – this one is the best of the lot. People close to Chris have done well preserving, building up, and promoting his legacy and genius. The book is available here and the 1st printing is a limited run of 500. I highly recommend it.